The Night Before "The Night Before"
Bah & the Humbugs reunited in 2013 to record an all-new song celebrating 20 years of The Night Before on XPN with Robert Drake. 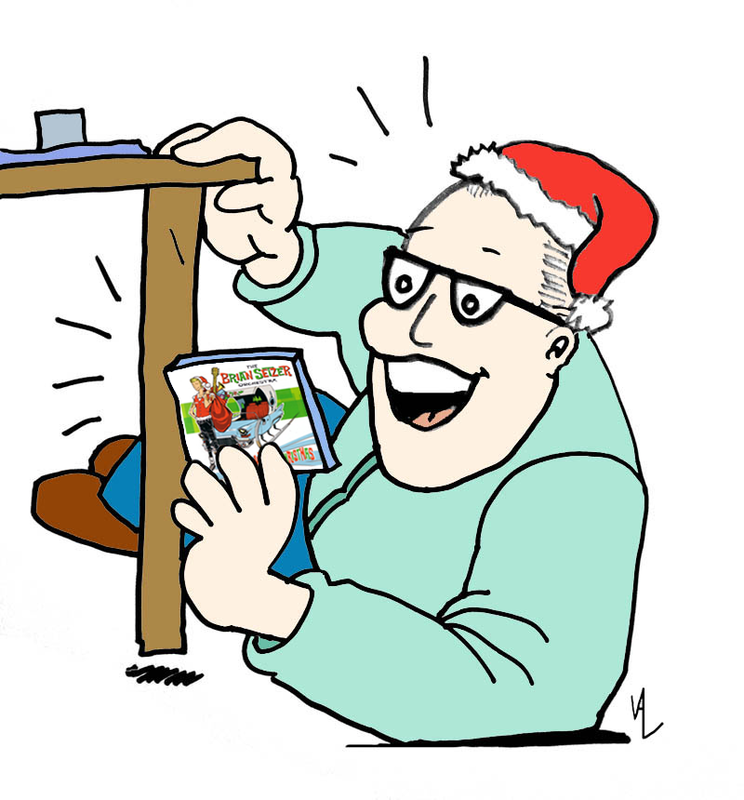 DJ Robert Drake, a fixture of the Philadelphia public radio community, showcases alternative Christmas music, including Bah & the Humbugs, every year on his 24-hour Christmas Eve program. 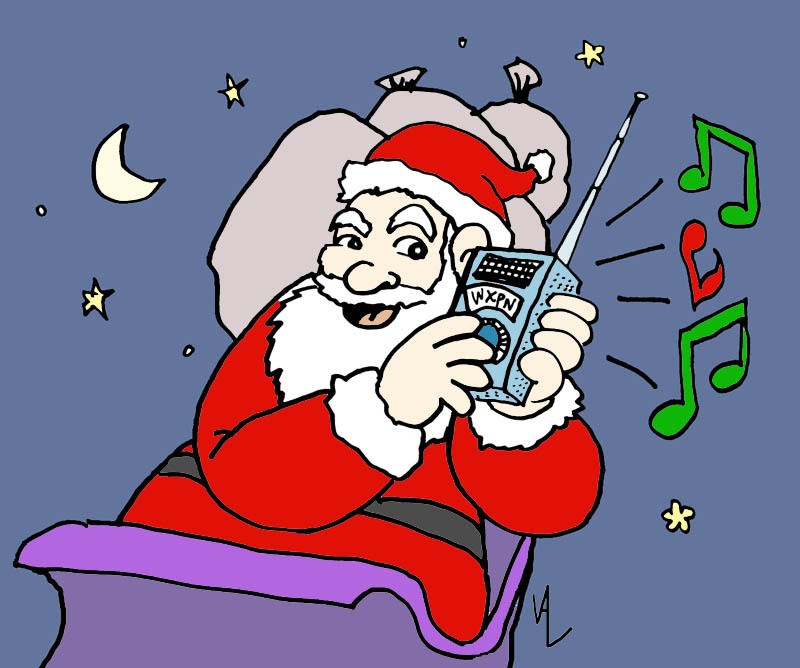 Drake notably and heroically mans the station entirely alone for his marathon 24-hour stint, which runs the entire day of Christmas Eve from midnight to midnight. The new song, which can be streamed or downloaded below, is a fictionalized account of last-minute preparations by Robert Drake in Philadelphia, and by Santa Claus at the North Pole, as they get ready for their respective December 24th committments. 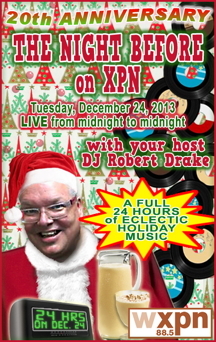 On December 24th, you can listen to The Night Before on XPN with Robert Drake at 88.5 FM in Philadelphia, or you can stream the program from anywhere in the world on XPN's website, xpn.org/xpn-programs/night-before. WXPN, the non-commercial, member-supported radio service of the University of Pennsylvania, was created in 1945, and has been broadcasting their award-winning program, Kids Corner for over twenty years. WXPN is also home to NPR-syndicated World Cafe. Download The Night Before "The Night Before"
Subscribe to the podcast: http://www.fjordstone.com/bah/bahcast.rss To subscribe to this podcast, copy the preceding URL and paste it into your podcast software. Direct link for iTunes users. Download the 2013 podcast directly: click here. Visit the downloads page for more free Bah & the Humbugs MP3s. Dateline: North Pole. Time to pack the sleigh. Load up all the toys. Soon be on our way. Check the GPS! Check the flying deer! Five thousand X-Boxes lost in the shuffle! Code Red Emergency! Call in every elf! Open every toy sack! Look on every shelf! For his 24-hour music marathon. All day on Christmas Eve he keeps the lights on. To wrap up all their presents and wait for Santa's sleigh. Just like 19 times before, he's setting up alone. He checks the Jingle Cam, plugs in his microphone. And that's just how it goes on the night before The Night Before. Santa calls his elves. It's time to gather round. They're all relieved to hear: the missing toys were found. Who knows how they wound up in dumpster 28? And Rudolph can't help us! His nose is out of whack! Without any headlights, those toys are going back! Mexicali Brass Band, and Vince Guaraldi Trio. And five different versions of "You're a Mean One, Mr. Grinch." But Brian Setzer Orchestra  where did that one go? It isn't under B, under S, or under O! But where's the missing disk? We only have one hour!! Emergency rhinoplasty — it was worth a try. Eight reindeer have red noses. Now we're fit to fly! Santa's fairly frazzled. He's pulling out his beard! "We need to start this sleigh ride. This night is getting weird!" Searching all of XPN for one misfiled CD. By miracle it turns up, in time to save the day. It was propping a table leg in the World Cafe. A calm guiding spirit who helps them succeed. At the Pole, it's the chief logistical elf. At XPN, it's the spirit of the station itself. "You're doing great! Remember to breathe. You're all set for showtime, Christmas Eve." Turned the radio on to hear Robert Drake. Makes this trip 'round the world seem like less of a chore. But first," Santa said, "I'll make a request. By e-mail? By chat room? No, Twitter is best." "#HoHoHo play some @theHumbugs tonight!"